Members of the Group had the opportunity on Tuesday to visit the crypt beneath St. John’s Parish church. The purpose of our visit was to see and asses the condition of a memorial plaque that was placed there on an unknown date. A Goole Times article from August 1998 showing the then Warden, Peter Dunleavy, pictured with it after he found it while preparing for the Church’s 150 year anniversary, with the accompanying article stating that there was only one name recorded – John F. Thorpe “who was killed in the Great War”. John Fillingham Thorpe was born on 6th July 1894. Just over twenty years later on 29th August 1914, while employed as a labourer, he presented himself at an enlistment office and ‘joined up’. Initially assigned to the King’s Own Yorkshire Light Infantry (No. 18463), he was reassigned to the Royal Naval Volunteer Reserve on 8th September (No. KW/129). After several months of training at Blanford Camp, Dorset, he was posted to Nelson Battalion, Royal Naval Division, then being prepared for transportation to Egypt as part of the Mediterranean Expeditionary Force, to be ultimately engaged in the landings at Gallipoli, where Nelson Battalion landed at Anzac Cove on 29th April, in company with Deal Battalion, Royal Marine Light Infantry. John reported ‘sick’ on 5th October 1915, being diagnosed with gastritis; it was to be the 2nd of the following month before he was able to return to his unit. The Gallipoli campaign came to an end in December with all units being withdrawn by the 20th. After refitting and bringing units back up to ‘strength’ in Egypt the Division was then transported to France, arriving in Marseilles between 12th – 23rd May 1916. Two days shy of his twenty-second birthday John was killed in action. He is buried in Tranchée de Mecknes Cemetery, Aix-Noulette. The exterior of the memorial plaque to John Fillingham Thorpe seemed to be in relatively good condition, in part with thanks to Peter Dunleavy who had carried out some restoration work on it. Unfortunately, the condition of the paper hadn’t faired so well – at some point water had damaged the paper within, the left hand side being easier to read than the right. The text appears to be based on Requiem Æternam. 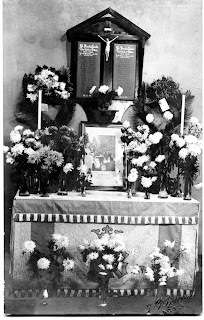 Prior to our visit, a copy of a postcard of a memorial that was once erected within St. Paul’s Church was passed on to Chris; this shows the memorial placed above several floral arrangements, but the occasion for this is not recorded. This scene was photographed by James George Powles. This plaque lists the names of 37 men who were associated both with the Church of St. Paul’s and the Sunday School to which many of them attended. Sometime after the picture of the memorial within St. Paul’s was produced an extra name was added to the left column, Herbert Clarke replacing the R.I.P. at the base. A great deal of information is known about a number of the men named on this plaque – including three Service Records, for John Brunyee (d.28.06.1916), Stanley Brunyee (d.30.03.1917) and Herbert Clarke (d.22.09.1917); along with biographies of Edgar Bowles (d.21.03.1918) and Percy Jeeves (d.22.07.1916). At some point members of the Group confused the two plaques mentioned above and came up with ‘one’, as such it was a great surprise to see both memorials and the good condition they are currently in. Hi. John is my 2nd cousin 3x removed. Is this memorial on public view?